The Vietnamese Culture Week opened at Chaktomuk theatre, in Phnom Penh, Cambodia, on September 11. The opening ceremony was attended by the Cambodian Minister of Cults and Religion Him Chhem, Cambodian Minister of Culture and Fine Arts Phoeurng Sackona, Deputy Minister of Culture, Sports and Tourism Le Khanh Hai, Vietnamese Ambassador to Cambodia Vu Quang Minh and many visitors and overseas Vietnamese in Cambodia. Speaking at the ceremony, Deputy Minister of Culture, Sports and Tourism Le Khanh Hai said that the relationship between the two countries is growing and achieving significant results in the fields of politics, economics, culture and education, bringing practical benefits to the people of both countries. For her part, Cambodian Minister of Culture and Arts Phoeurng Sackona expressed her pleasure in coordinating the organization of the Vietnam Cultural Week in Cambodia. On the significance of the cultural cooperation program between the two countries, she said that it reflects the good tradition relations between the two countries. The Minister of Culture and Arts believes that it will be a driving force to continue promoting cooperation in all fields between Cambodia and Vietnam. 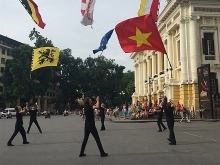 The opening ceremony featured Vietnamese folk songs and dances and performances of traditional Vietnamese musical instruments, as well as melodies praising the Vietnam-Cambodia friendship. 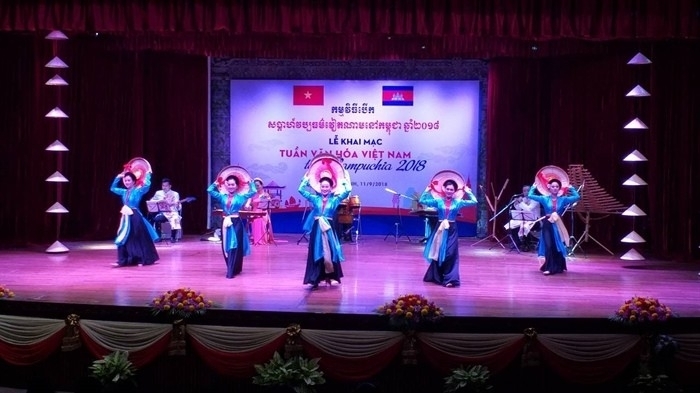 As planned, after a performance in Phnom Penh, the Vietnamese art delegation, led by Deputy Minister of Culture, Sports and Tourism Le Khanh Hai, will continue to perform in Battambang province, Cambodia.